As far back as I can remember, my mother has made her own pickles for Pesach. It was a tradition she got from her mother, no doubt because they did not use Passover vinegar or fresh garlic. I can’t say that I liked them, so I never continued the tradition. 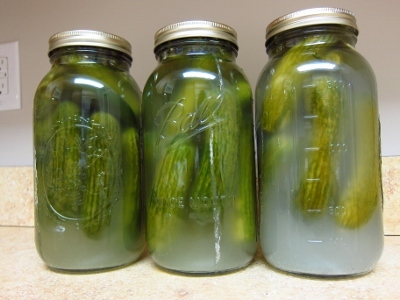 Her pickles would sit for weeks in the boiler room and then on the window sill throughout Yom Tov. They were soft and mushy inside (practically alive!) and I stayed far away from them. Now my brother has experimented with his own version and this is the first year that I am attempting my own jars of fresh homemade pickles for Pesach. If you use kosher for passover vinegar, you can use equal amounts of water and vinegar, and cut down the salt to about 2 Tbsp. They are quite simple to prepare. First, I bought a couple of 8-cup “ball” brand jars with a 2 pc screw on cover. While preparing the cucumbers, I soaked the rubber part of the cover in hot water. Start by putting the dill and garlic cloves on the bottom of the jar. Top with cucumbers and jalapeno peppers. Pour salt into the jar, fill with water, and tightly screw on the cover. Store in a cool dry spot for 2-3 weeks. Store jar upside down for the first 24 hours. When pickles are to your liking, store in the refrigerator. note: The pickles were delicious (albeit a bit salty). By request, I will have to make more next year!! It’s time to pull out the Pesach recipes and plan what to make for the upcoming festival! This pyramid shaped confection is the first on the list of many recipes which have become a favorite of my friends and family. Mix first 3 ingredients in heavy large saucepan. Cook over medium heat until mixture appears somewhat pasty, stirring constantly, about 12 minutes. Remove from heat. Mix in 1 1/2 teaspoons vanilla extract and 1/4 teaspoon almond extract. Spread out coconut mixture on large baking sheet. Refrigerate until cold, about 45 minutes. Line another baking sheet with parchment. Press 1/4 cup coconut mixture into pyramid shape (about 1 1/2 inches high). Place on prepared sheet. Repeat with remaining coconut mixture. Bake cookies until golden, about 30 minutes. Transfer cookies to rack and cool. 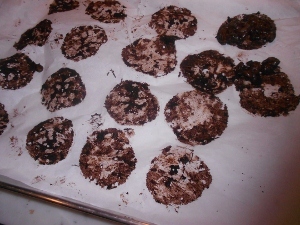 Set cookies on rack over rimmed baking sheet. Stir chocolate and cream in heavy medium saucepan over medium heat until melted and smooth. Remove from heat. Mix in remaining 1/4 teaspoon vanilla extract. 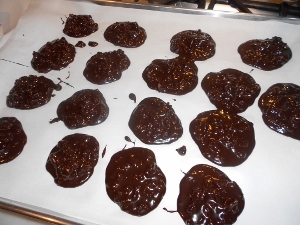 Spoon glaze over cookies, covering almost completely and allowing chocolate to drip down sides. Refrigerate until glaze sets, at least 2 hours. These cookies are outragously dark and delicious and almost ridiculously easy to make. They don’t contain potato starch so they don’t taste pesachdig and there’s never a crumb of these left after pesach! 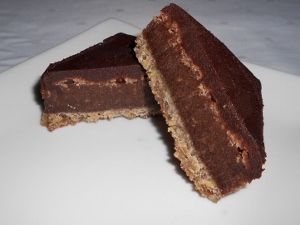 This recipe was printed in a Feb/Mar 2006 issue of Chocolatier Magazine. 1. Place rack in center of oven and preheat to 350 degrees. 2. With the padle attachment mix cocoa, confectionary sugar and salt on low for 1 minute. 3. In a small bowl, whisk the whites and vanilla. With the mixer on, slowly add whites to dry ingredients. Turn speed up to medium and mix 2 minutes. 4. Using 1/4 cup measure, scoop and mound batter, spacing 3-inches apart. 5. 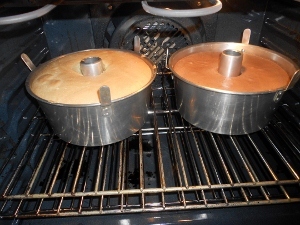 Place pan in oven and immediately lower the temperature to 320 degrees. 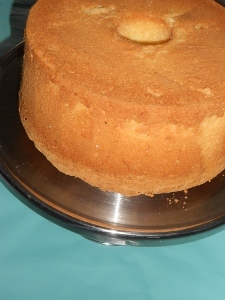 Bake for 12-15 minutes or until small, thin cracks appear on the surface. As one of the shiv’as haminim, pomegranate seeds were included on our platters. While pomegranate was once reserved for a yearly Rosh Hashana treat, it has become an all year round staple in all groceries and supermarkets as well as a jewel-like accessory to sprinkle on salads. 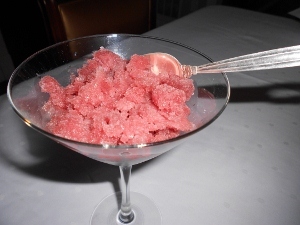 I was recently served this pomegranate ice alongside a triangle slice of the Chocolate Lovers Truffle Brownies from Suzie Fishbein’s Kosher by Design cookbook. 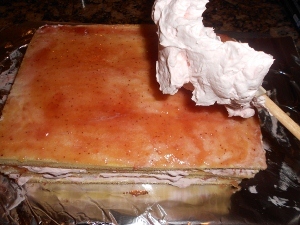 It’s a winning combination – with the tartness of the pomegranate ice perfectly offsetting the richness of the cake. Add the pomegranate and lemon juices. Freeze overnight. Defrost 10 minutes. 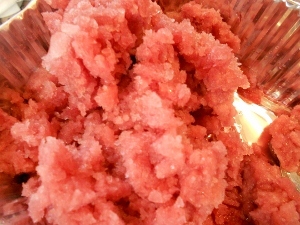 Blend or process in food processor. Refreeze. Check texture before serving. If necessary, defrost briefly and re-blend.